Is your website attracting new leads? Is it up to date with current content and useful information? Is it easy for prospective customers to find what they are looking for? Get a website that grows your business. Having a professional, well designed website adds credibility to your business, whether you're big or small, new or well-established. It also helps you reach potential customers who would otherwise never find you. Finding the balance between price, style, and functionality in a website is a hard thing to achieve when looking for the right website design company. Because we are a website design company as well as graphic design company we have a better understanding of how important it is to provide functional website design solutions combined with aesthetically pleasing graphics to achieve successful website development results. The fact is that in today's world a well designed website is one of the greatest assets your company can have. Don’t just keep up; stand out with KrissArt Marketing Design. Stay focused on your business, not your website. Let us make your website changes you need as often as you like. We work with your team to ensure your website remains current and functional. Getting started is fast, simple, and secure. We know you want speedy, accurate, updates. You will communicate directly with our web expert personally to implement your changes and manage your website. Our years of industry experience becomes yours. We know what works and what doesn't work. You will get efficient and reliable results. Browsing the internet and accessing a website today is not exclusive to laptops or desktop computers, new mobile devices allow millions of users around the world to also access websites. This makes responsive web design highly recommended for your website, to be visible through any device. 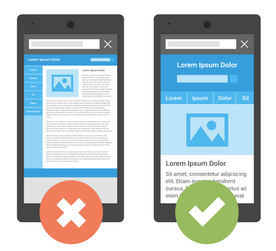 Google is boosting the ranking of mobile-friendly pages on mobile search results. Not sure if you site is mobile-friendly? Click here for more information.